This is a favorite side dish of mine that, for some reason, I haven’t made in years. Couldn’t tell you why. I made it Thursday night as a last minute decision—I had a bunch of haricot verts that I intended to boil quickly, shock, drain, and then cover in a bit of lemon butter. But, for the first time in forever, I was running out of butter. I very purposely didn’t buy it when I went shopping because every time I buy butter I find 4 sticks tucked away in the fridge. Life is hard when you’re out of butter. So I decided to roast them instead. Normally, when I make this I’m using full on, fat-assed green beans. And I learned through trial and error back in high school (when I first found this recipe, in an issue of Details, no less) that with green beans that thick, you just have to boil them first. You’ll never get them tender enough by roasting them without also burning the living hell outta them. But I was using lovely, slender, tender haricot verts and they require no pre-boiling whatsoever. They came out delicious, sizzling in a bit of olive oil, seasoned by chopped garlic and onion rings. During the last few minutes of cooking, I grabbed a lemon and squeezed it over the beans. It added a bit of bright flavor which really made a difference overall. The best thing about this recipe is that it’s barely a recipe at all—it’s more of a method. Amounts just don’t matter; you could do this with one serving of beans in your toaster oven if you felt fanciful. Not that I recommend that if other people will be present. Jealousy runs high once the smell of this gets around; you’d better be ready to share. I’ve never had this dish anywhere else, neither at restaurants nor people’s houses and when I make it for people, they are usually surprised. Apparently people aren’t roasting their green beans on a widespread level. So start a new trend, get to roasting! Like I said, the ingredients are vague because amounts just don’t matter. This is a method, not a recipe. 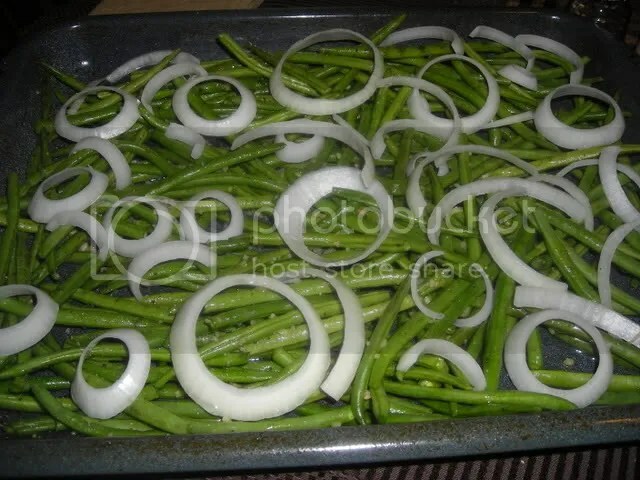 If using green beans, boil until fork-tender, drain, and place on a baking sheet with a lip. If using haricot verts, just place on the sheet. Throw some chopped garlic in there, as much or as little as you want. Drizzle the beans with olive oil, but not too much. We don’t want to drown them, just barely coat them all. Salt and pepper the batch, and toss everything together gently with a spoon to evenly coat and season the beans. Place the onion rings over the top, rubbing a bit of oil on them if you like. Place your oven rack in the second highest position, turn to BROIL, and put in the beans. Every five minutes or so, shake the pan and check your progress. Some of the beans will start to turn brown, the oil will start to sizzle slightly, and a heavenly aroma will begin to pour from your oven. Take a bean from the pan and test it. If they seem to be turning brown faster than they’re turning tender, move the rack down another notch. Once you’ve determined that the beans only need a few minutes longer, squeeze some fresh lemon juice over the beans and put them back in the oven. Once finished, remove the beans, garlic, and onion rings to a serving bowl or plate. I don’t have a picture of the finished product, because they were pounced upon pretty quickly. Next time! Last night I made a dish that C and I first had at her brother’s house during our month-long evacuation. That was a crappy time, eased somewhat by the fact that we were staying at a gorgeous house in West Palm Beach, FL with her brother and his wife, both of whom we like very much. We’ve been making it since, with slight variations but it’s pretty much the same basics every time. This recipe makes a LOT, since it’s great left over and I plan to send some home with M tomorrow night. You can certainly halve this with no problem whatsoever. 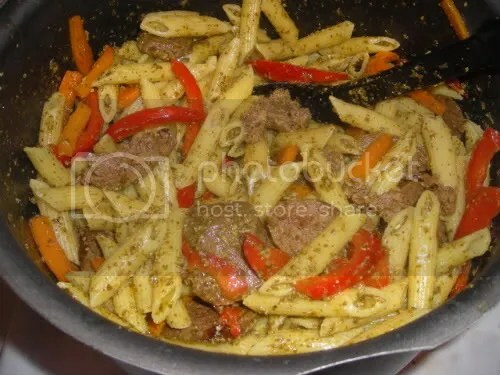 Tonight, I am making this with a mixture of sausage: 2 links of Italian beef and 2 links of Linguisa. I was at Central Market and I was bored. Also, I’m using 1 red and 1 orange bell pepper because it just looks so pretty. I really don’t recommend using green bell pepper in this dish. Aside from not having enough of a flavor kick, it looks really boring against the pesto. Add some color!! Red and orange! Maybe even a yellow if you’re having that kind of day. Also, this is GREAT with onion, but I never use it because then C will have a giant picky fit. And by that I mean that she will sit there and pick through her food and separate the onions from the rest of it and I will have bought and chopped the onion for no reason other than to sit there and watch her identify and separate it. So I don’t bother. But don’t let that stop you! 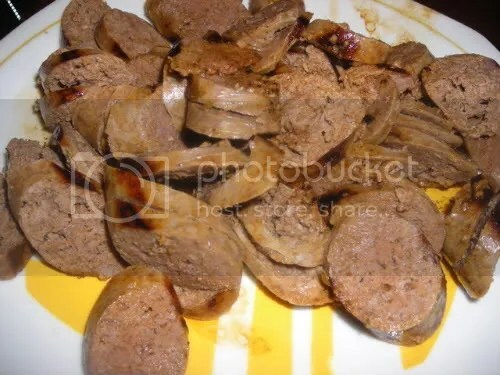 Place the sausage links into a large pan and cover with water. Bring to a boil, then lower heat and simmer the sausage for approximately 7-10 minutes. Remove the sausage to a plate, drain the water from the pan, dry pan with a paper towel, and return the sausage to the pan. 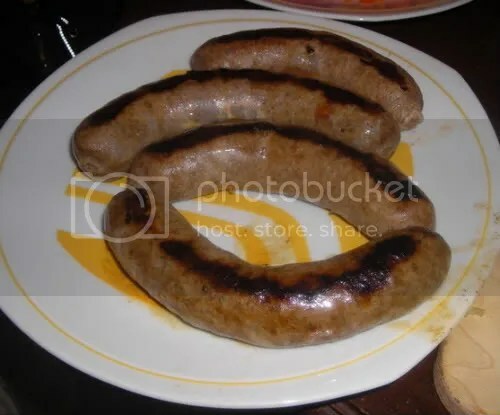 Brown sausage on each side and then put the sausage on a plate once more. Allow to cool. 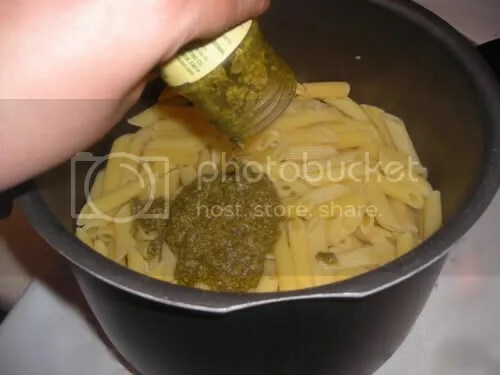 Start boiling the water for the pasta and cook according to directions. Once the sausage has cooled slightly, cut it at a slight angle to give you elongated medallions that mimic the shape of the pasta. 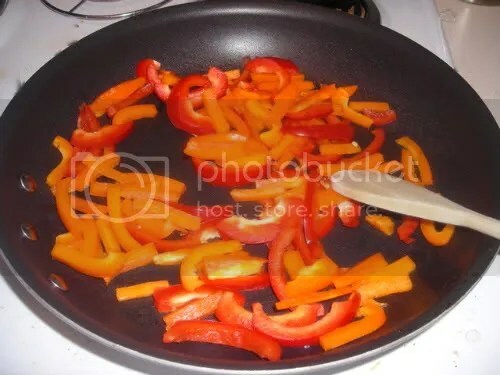 Saute the peppers in the pan until they are crisp-tender, then add the sausage back to the pan to heat through. 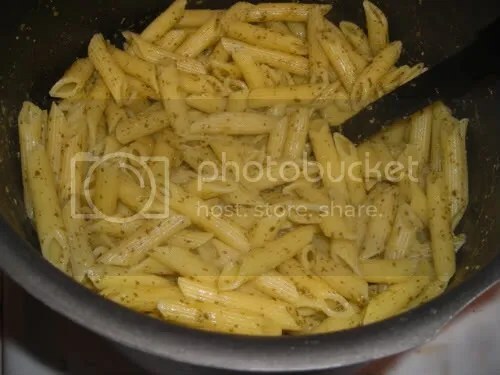 Once the pasta is done, drain and return to the pot or place in a large bowl. Add the pesto to coat and toss gently with a spoon. It didn’t look like nearly enough, so I added the second one. That looked good, but then I put in the peppers and sausage and most definitely needed the third jar. So in it went. 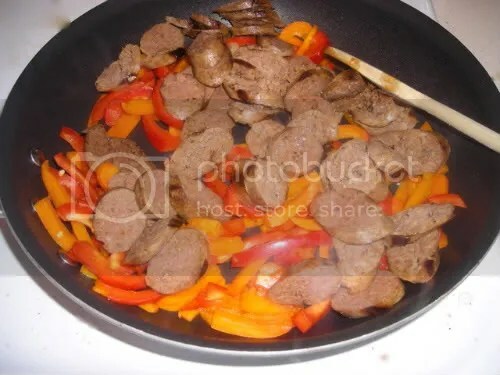 Fold in the peppers and sausage. Add more pesto as desired. 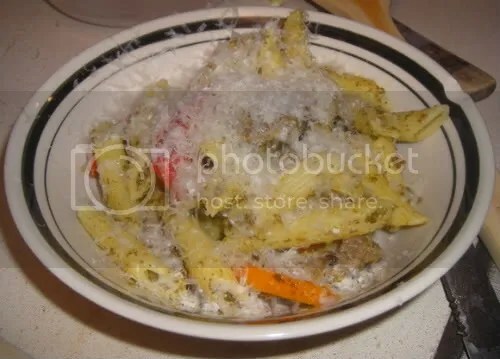 Serve warm in a bowl with copious amounts of freshly grated cheese on top. I cannot even tell you how much I love my microplane grater that M gave me for Christmas. It grates everything: cheese, spices, citrus . . . it is the best thing in the entire world. And there is NOTHING better than freshly grated Parmesan. If I had a food processor (hint hint to people, my birthday is soon) then I would be making this nonstop. In fact, I used to make it nonstop and many people were grateful and they loved me immensely. I bring to you . . .
Chop garlic in food processor. Add chickpeas and puree until they’re almost smooth. Add tahini, lemon juice, salt, and cumin. With the machine running, slowly add the oil until it is fully incorporated the hummus is creamy. Taste and add more seasoning or lemon juice as needed. Serve with warm or grilled pita wedges. Of course, this tastes amazing with additions like sun-dried tomatoes or roasted red pepper. Do whatever you want, experiment. There was one place in Lafayette that served their hummus with those two ingredients, kalamata olives AND feta cheese over the hummus. It was like a giant salad on a plate. And now I’m really hungry and craving that so REALLY, someone should buy me a food processor. Now. You are currently browsing the Fixin' to Eat blog archives for May, 2008.